Want to Ski? Speak to me? Learn with Ski-Reg, one of the worlds most experienced instructors! Why not try something different this holiday? Amaze your friends and tell them you went water skiing! 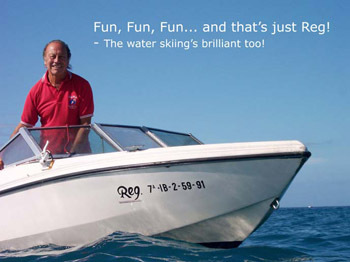 Let one of the world's most experienced and successful instructors teach you the simple secret to successful water skiing – Ski-Reg has a success rate of over 90% with total beginners! One-to-one tuition for optimum performance and with your safety in mind a life jacket is provided while skiing. All ages and level of skiing ability are welcome.